"John Carver has given board effectiveness a unifying vision, a logical and coherent base-an integrated theory of governance. This collection of his writings brings home the intellectual rigor of his thinking and the coherence of his Policy Governance model." "John Carver, like Robert K. Greenleaf before him, is a revolutionary of the very best kind. Carver's Policy Governance model has provided the means for trustees to live out Greenleaf's challenge to boards to act as both servant and leader. In so doing, John has proven himself to be one of our greatest servant-leaders." "The conceptual clarity of Dr. Carver's approach provided us an excellent basis for development of new governance arrangements in defence, helping us to sharpen our focus on results and the associated accountability framework." John Carver is internationally known as creator of the breakthrough in board leadership called the Policy Governance model. He has worked with boards in the United States and Canada and on four other continents for over twenty years. His ideas have been featured by the Times of London, the National League of Cities, the Canadian Hospital Association, the American Society of Association Executives, Georgia Power Company, and many others. 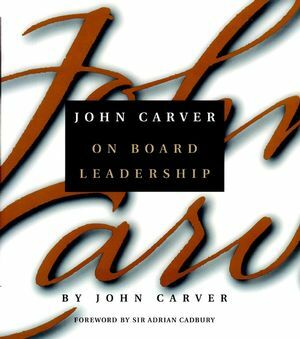 Carver is the author of the bimonthly newsletter workshop Board Leadership (since 1992), the book Boards That Make a Difference, Second Edition (Jossey-Bass, 1997), the video John Carver on Board Governance (1993), the audiotape Empowering Boards for Leadership (1992), and coauthor of the books A New Vision of Board Leadership (1994), Reinventing Your Board (Jossey-Bass, 1997), and the CarverGuide Series on Effective Board Governance (Jossey-Bass, 1996-1997). 1. A Theory of Governance: The Search for Universal Principles. A Theory of Governing the Public's Business: Redesigning the Jobs of Boards, Councils, and Commissions. Is Policy Governance the One Best Way? Watch Out for Misleading Interpretations of Governance Research. Why Is Conceptual Wholeness So Difficult for Boards? Are Boards Searching for the Holy Grail? Can Things Go Horribly Wrong for Boards That Use Policy Governance? 2. The Moral Basis of Board Authority: Where the Chain of Command Begins. Understanding the Special Board-Ownership Relationship. Determining Who Your Owners Are. What to Do If You Find a Consumer on Your Board. Achieving Meaningful Diversity in the Boardroom. Making Hierarchy Work: Exercising Appropriate Board Authority in the Service of Mission. Elected Boards: Meeting Their Special Governance Challenge. Your Board's Market Surrogate Obligation. Leading, Following, and the Wisdom to Know the Difference. Families of Boards, Part One: Federations. Families of Boards, Part Two: Holding Companies. When Owners Are Customers: The Confusion of Dual Board Hats. 3. Creating the Board's Single Voice: Appropriate Roles of Committees, Officers, and Individual Members. Creating a Single Voice: The Prerequisite to Board Leadership. Boards Should Have Their Own Voice. Protecting Board Integrity from the Renegade Board Member. When the Founding Parent Stays on the Board. The Executive Committee: Turning a Governance Liability into an Asset. Recruiting Leaders: What to Look for in New Board Members. Should Your CEO Be a Board Member? What If the Committee Chair Just Wants to Know? Reining In a Runaway Chair. Does Your Board Drive Away Its Most Promising Members? A Few Tips for the Chairperson. Sometimes You Have to Fire Your Chair. What to Do with Your Board's Philosophy, Values, and Beliefs. Crafting the Board Job Description. 4. Linking Governance to Operations: The Board-Management Connection. To Tell or Not to Tell: One CEO Learns the Right Way to Inform Her Board. Governing in the Shadow of a Founder-CEO. If You Want It Done Right, Delegate It! What to Do When Staff Take Complaints Directly to Board Members. When Board Members Are the Only Staff in Sight. The CEO's Objectives Are Not Proper Board Business. Why Only the CEO Can Interpret the Board's Ends and Executive Limitations Policies. Getting It Right from the Start: The CEO's Job Description. Do You Really Have a CEO? Does Policy Governance Give Too Much Authority to the CEO? 5 Putting Purpose First: Deciding, Delegating, and Demanding Organizational "Ends". Boards Lead Best When Services, Programs, and Curricula Are Transparent. A Community Board Struggles with the Cost of Its Results. The Board of a Trade Association Establishes Ends Policies. A Public School Board Establishes Ends Policies. A City Council Creates Ends Policies. A Hospital Board Creates Ends Policies. 6. Safely Avoiding Micromanagement: Staff Freedom Within Defined Limits. Free Your Board and Staff Through Executive Limitations. Crafting Policy to Safeguard Your Organization's Actual Fiscal Condition. Crafting Policy to Guide Your Organization's Budget. Redefining the Board's Role in Fiscal Planning. 7. What the Board's Words Mean: Harnessing Interpretation for Control and Empowerment. The "Any Reasonable Interpretation" Rule: Leap of Faith or Sine Qua Non of Delegation? Boards Should Be Not the Final Authority but the Initial Authority. Abstracting Up: Discovering the Big Issues Among the Trivia. Who's in Charge? Is Your Organization Too Staff-Driven? Never Cast in Stone: Flexible Policy Supports Management and Saves Board Time. Policy Governance Is Not a "Hands Off" Model. 8. When the Board Meets: Products, Process, Discipline, and Costs. 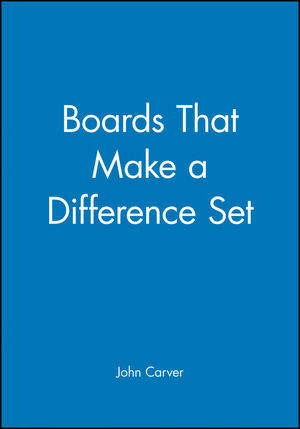 Is Your Board in a Rut? Shake Up Your Routine! Why Not Set Your Quorum Requirement at 100 Percent? Owning Your Agenda: A Long-Term View Is the Key to Taking Charge. Calculating the Real Costs of Governance. The Consent Agenda and Responsible Rubber-Stamping. 9. 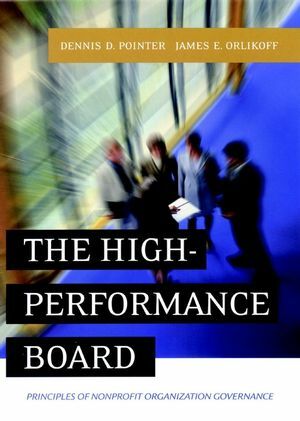 Assuring Board and Management Performance: Measurement, Evaluation, and Discipline. Painful Lessons: Learning from the United Way Misfortune. One Board Fails to Follow Its Own Monitoring Policy-and Courts Fiscal Disaster. The Misguided Focus on Administrative Cost. A Simple Matter of Comparison: Monitoring Fiscal Management in Your Organization. Board Approvals and Monitoring Are Very Different Actions. Giving Measurement Its Due in Policy Governance. Honey, I Shrunk the Policies. The Mechanics of Direct Inspection Monitoring. Redefining Board Self-Evaluation: The Key to Keeping on Track. Living Up to Your Own Expectations: Implementing Self-Evaluation to Make a Difference in Your Organization. The Importance of Trust in the Board-CEO Relationship. Evaluating the CEO: An Effective Approach to Ensure Future Organizational Success. Putting CEO Evaluation in Perspective. Off Limits: What Not to Do in Your CEO Evaluation. 10. Safeguarding Governance Viability for the Long Term. What to Do When All Your Policies Are in Place. Nine Steps to Implementing Policy Governance. What Happens to Conventional Documents Under Policy Governance? How You Can Tell When Your Board Is Not Using Policy Governance. CEOs! Guiding Your Board Toward Better Governance. Policy Governance Won't Work Because . . . Protecting Governance from Law, Funders, and Accreditors. 11. When Governing Boards Perform Nongoverning Roles. When Board Members Act as Staff Advisors. Tips for Creating Advisory Boards and Committees. Giving, Getting, and Governing: Finding a Place for Fundraising Among the Responsibilities of Leadership. Girl Scout Council Learns What Kind of Help Counts the Most. Board Members as Amateur CEOs. 12. Policy Governance for Specific Audiences. Education Accountability and Legislative Oversight. New Means to an End. To Focus on Shaping the Future, Many Hospital Boards Might Require a Radical Overhaul. Corporate Governance Model from an Unexpected Source-Nonprofits. A Theory of Corporate Governance: Finding a New Balance for Boards and Their CEOs. The Opportunity for Reinventing Corporate Governance in Joint Venture Companies. What Use Is Business Experience on a Nonprofit or Governmental Board? Seizing the Governance Opportunity for Central European NGOs. Building an Infrastructure of Governance in Eastern Europe.